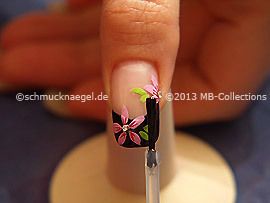 Flowers design with nail lacquer and strass stones – Step by step instruction. Begin on the left edge of the fingernail and draw with the nail lacquer in the colour black a curved line to the right edge of the fingernail. 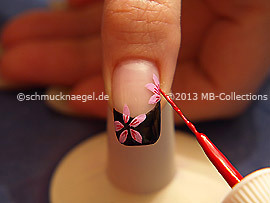 Now paint the front part of the fingernail with the nail lacquer in black. 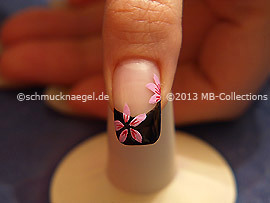 Draw with the nail art liner in the colour pink several petals on the fingernail. 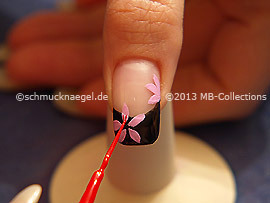 Now fill the inner surface of the petals with the nail art liner in pink (see on the left side). The flowers design with nail lacquer and strass stones should correspond approximately to the picture. Draw with the nail art liner in the colour red two short lines in the petals. Now set two drops of the clear nail lacquer on the fingernail, as attachment for the strass stones in crystal. Moisten easily the tip of the spot-swirl or a toothpick and take up a strass stone in crystal, which should stick to the tip. Set the strass stone on the damp clear nail lacquer. Repeat the procedure for a further strass stone in crystal. Draw with the nail art liner in the colour bright green four small petals on the fingernail (see on the left side). After the clear nail lacquer is dried, the flowers design with nail lacquer and strass stones is finished. Flowers design with nail lacquer and strass stones was last modified: November 23rd, 2016 by Make it Smart e.K.